MONROVIA, Liberia – Liberia’s president was sworn in Monday for a second term in a ceremony attended by her bitter rival, whose refusal to recognize her victory had threatened to undermine this country’s fragile peace. The 73-year-old Ellen Johnson Sirleaf addressed opposition leader Winston Tubman, thanking him for agreeing to attend the ceremony, where he was seated in a place of honor in the front row. The ceremony was also attended by a nine-member delegation from the United States, including Secretary of State Hillary Rodham Clinton. Tubman had called for a boycott of the November vote, after it became clear that he could not beat Sirleaf, prompting many to accuse him of being a spoiler. His supporters repeatedly clashed with police and until this weekend, he continued to say he would not recognize Sirleaf and that he would lead a demonstration on the day of her inauguration. He changed his mind only after a private meeting with Sirleaf on Saturday. Sirleaf became an international symbol of women’s empowerment when she became Africa’s first elected female head of state in 2005, just two years after the end of the nation’s disastrous 14-year civil war. Her popularity has continued to soar abroad, even as it plummeted at home due to endemic poverty and the country’s crippling unemployment. Days before last year’s election, she was awarded the Nobel Peace Prize, further underscoring the contrast between her image inside and outside the West African nation. Tubman’s party accused the president of having done too little to end the country’s poverty. Liberia remains one of the world’s poorest nations, ranked nearly at the bottom of the United Nations’ index tracking development. Economists disagree, however, saying the country was on its knees when she took over. Nearly 80 percent of its schools were destroyed and almost all the roads were impassable. In the years since she took office, the government added nearly 3,500 miles of paved roads and people are earning double what they made when she was first elected, according to a report by the ministry of planning and economic affairs. 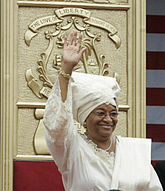 In her inaugural address, Sirleaf directly addressed those who feel she has not done enough to lift them from poverty. GUATEMALA CITY – Retired Gen. Otto Perez Molina was sworn in as president of Guatemala on Saturday, calling on the United States and Mexico to help him fight a wave of drug trafficking and violence that has overwhelmed the Central American country. 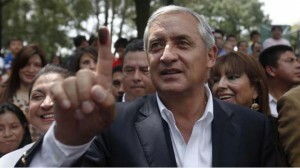 Perez won over voters by pledging to crush criminality with an “iron fist.” Mexican drug cartels have seized large swatches of territory in Guatemala, which has one of the world’s highest homicide rates. Perez, 61, is the first military officer elected as Guatemalan president since the end of a military government 25 years ago. He served in that administration as director of intelligence. …..
His tough campaign resonated in a country of more than 13 million people where murders are committed at a rate of 41 for every 100,000 residents, according to a recent U.N. homicide report. That is well over twice the rate in neighboring Mexico. …..
Close advisers say Perez supports meeting the conditions set by the U.S. Congress for restoring aid it eliminated in 1978 — halfway through the Central American country’s 36-year civil war. Among the requirements is reform of a weak justice system that has failed to bring to justice those responsible for abuses during the [civil war]. A U.N.-sponsored postwar truth commission said state forces and related paramilitary groups committed most of the killings. The U.S. also insists that the government back a U.N.-supported international anti-corruption team whose prosecution effort has been criticized by Guatemala’s political elite. Perez has long insisted there were no massacres, human rights violations or genocide in a conflict that killed 200,000 civilians, mostly Mayan Indians. “I suffered and lived through the armed conflict and 15 years after having signed the (peace) agreement Guatemalans are still being betrayed,” Perez said on Saturday. “I pray to God for a true reconciliation. I pray that my generation is the last of war and the next one is the first of peace.” …..
Taiwan’s incumbent President Ma Ying-jeou has won a second term in office, promising to further improve ties with neighboring China. His main opponent, Tsai Ing-wen, said she took responsibility for the defeat and resigned as leader of the Democratic Progressive Party (DPP). Mr. Ma had campaigned on his record of improving ties with China. China does not recognize Taiwan, regarding the island as a breakaway province. It wants unification. “In the next four years, cross-strait relations will be more peaceful, with greater mutual trust and the chance of conflict will be less,” Mr. Ma told jubilant supporters. Earlier, Ms. Tsai told party workers she accepted the Taiwan people’s decision and congratulated President Ma. “We want to give our deepest apology to our supporters for our defeat,” she said. Ms. Tsai’s DPP favors formal independence from China, although Beijing has repeatedly threatened retaliation if Taiwan makes such a move. …. a) Of the three countries, which has the smallest population? b) Which of the three countries is an island? c) Name the capital of each country. d) Which president was not an incumbent? b) What did Ellen Johnson Sirleaf become the first person to do in Africa? b) Describe the crime problem in Guatemala. b) How did opposition party candidate Tsai Ing-wen and her party, the Democratic Progressive Party (DPP) differ from President Ma in the position they took regarding Taiwan’s relationship with China? Liberia, “land of the free,” was founded by free African-Americans and freed slaves from the United States in 1820. An initial group of 86 immigrants, who came to be called Americo-Liberians, established a settlement in Christopolis (now Monrovia, named after U.S. President James Monroe) on February 6, 1820. The Mayan civilization flourished throughout much of Guatemala and the surrounding region long before the Spanish arrived, but it was already in decline when the Mayans were defeated by Pedro de Alvarado in 1523-24. The first colonial capital, Ciudad Vieja, was ruined by floods and an earthquake in 1542. Survivors founded Antigua, the second capital, in 1543. Antigua was destroyed by two earthquakes in 1773. The remnants of its Spanish colonial architecture have been preserved as a national monument. The third capital, Guatemala City, was founded in 1776. Guatemala gained independence from Spain on September 15, 1821; it briefly became part of the Mexican Empire, and then for a period belonged to a federation called the United Provinces of Central America. From the mid-19th century until the mid-1980s, the country passed through a series of dictatorships, insurgencies (particularly beginning in the 1960s), coups, and stretches of military rule with only occasional periods of representative government. The U.S. has full diplomatic ties with China but is also committed, under the Taiwan Relations Act of 1979, to an unofficial relationship with Taiwan and to help the island defend itself against any unprovoked aggression. Congress intended for the Taiwan Relations Act to preserve a relationship with a traditional ally of the United States after President Jimmy Carter decided to transfer diplomatic recognition from Taipei to Beijing. For a brief History of Taiwan, go to taiwandc.org. Read background information on Taiwan at the U.S. State Department website. Read an article about former Taiwanese president Chen Shui-ban at studentnewsdaily.com.